He always said that you have to "take out the families"
We had heard this already but this seems like a big confirmation of the details. WASHINGTON — The Ritz-Carlton in Saudi Arabia's capital bills itself as an "elegant oasis" that "completely envelops its discerning guests in majestic surroundings." 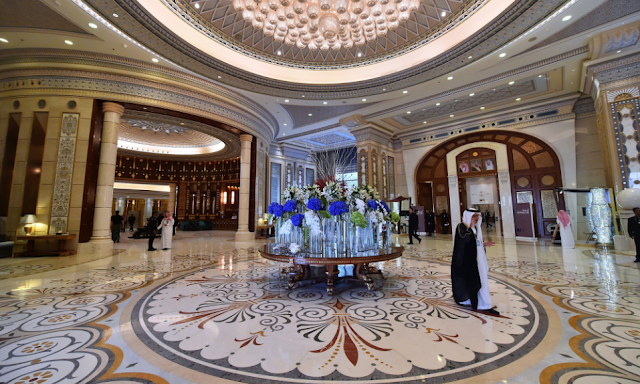 But a year ago Sunday, on Nov. 4, 2017, the ultra-luxurious Riyadh hotel — with its marble floors and vast indoor swimming pool — became a gilded prison, when hundreds of Saudi royals, billionaires and senior government officials were detained in an extraordinary power play by the heir to the throne, Crown Prince Mohammed bin Salman. The involuntary guests were told they had to sign away large chunks of their assets to be released. The detention involved both psychological abuse and — in some cases — torture, current and former U.S. officials say. The move, described by Saudi authorities as a crackdown on rampant corruption, allowed the crown prince to tighten his grip and sent a shock wave through the kingdom's elites. "This was a shakedown operation and a power consolidation operation," said one former senior U.S. official who was in office at the time. The Ritz detentions were designed "to remind people going forward that their wealth and their well-being would depend on the crown prince and not anything else, which is why it was so upsetting for many in the royal family," said the former official, who spoke on condition of anonymity. A year later, the event has taken on even more importance in the wake of the death of the Saudi writer Jamal Khashoggi, who was murdered after entering the Saudi consulate in Istanbul on Oct. 2. Bin Salman is suspected of ordering Khashoggi's death, and is struggling to defuse the crisis that has put the country's international standing in jeopardy. If bin Salman survives the fallout over the killing of Khashoggi, it will be in part due to the roundup at the Ritz, when he crushed his rivals and potential opponents. Some of those targeted included royals or officials linked to the late King Abdullah, who died in 2015. His relatives and associates are distrusted by the circle around King Salman, who now holds the throne. But the crackdown generated deep resentment in the House of Saud and numerous enemies, experts and former officials said, and the crown prince could face more resistance from his internal adversaries. Bin Salman, keenly aware that Saudi Arabia's King Faisal was murdered by a disgruntled nephew in 1975, devotes elaborate attention to his personal security, one former U.S. intelligence officer told NBC News. The details of exactly what happened to those detained at the Ritz have remained shrouded in secrecy, and the fate of those still held also remains unclear. A second hotel, the Courtyard by Marriott, located just across the street from the Ritz, was also used as a high-end detention center when space ran out at the Ritz. Both hotels were closed to the public during the operation. The Ritz did not respond to a request for comment. A U.S. intelligence official and two former senior U.S. government officials told NBC News that the detainees were coerced, abused and tortured. The sources, who spoke on condition of anonymity, declined to divulge details, which were contained in classified intelligence reports. The detainees were deprived of sleep, beaten and interrogated with their heads covered. Seventeen were hospitalized, according to the New York Times. One detainee, a Saudi military officer, Maj. Gen. Ali al-Qahtani, died in custody. The Saudi authorities have yet to offer an official explanation in the case. He was a top aide to Prince Turki bin Abdullah, a son of the late King Abdullah. Saudi Arabia has denied that any abuse or torture took place during the detentions. The Saudi embassy in Washington did not respond to requests for comment. Trump's on board because he believes in torture and had it in mind that this was about money, which is the only way his mind can wrap around world affairs. 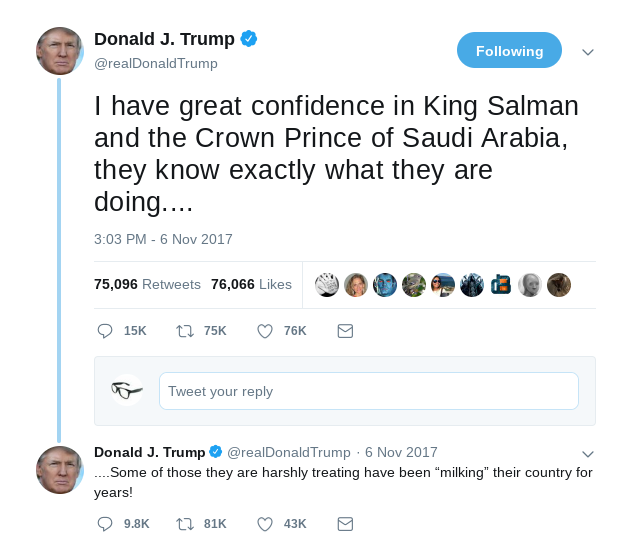 It was --- MBS was shaking down his realtives. But it was really about seizing power and getting rid of rivals. Trump has certainly kept that last hope alive here in the US too --- the "lock her up" chants have now evolved to include all Democratic rivals.